I found myself spending the day exploring Philadelphia. 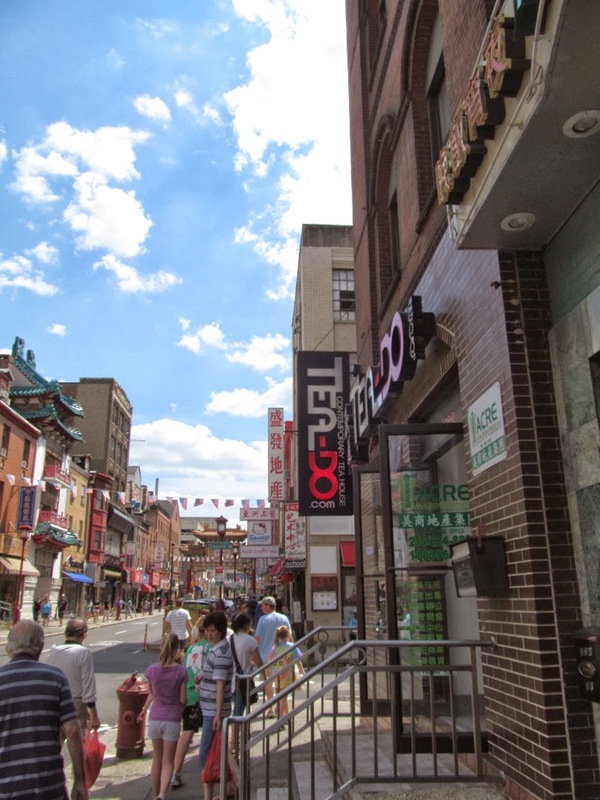 While wandering around the city, I ended up in Chinatown. 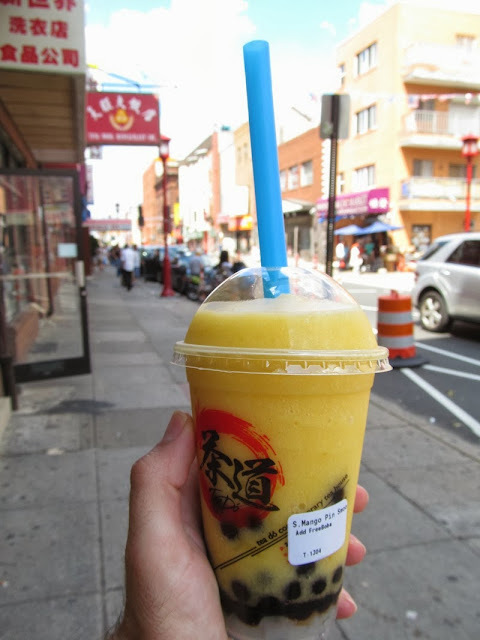 I honestly had no clue that Philadelphia had a Chinatown before I wandered into the neighborhood, but while there I decided to get something edible. This ended up being boba tea from a place called Tea-Do. Tea-Do had food on the menu, but I decided to only get a drink here. I had a mango smoothie with boba and mango jelly floating around in the drink. The smoothie was good, cold, and very refreshing. I liked the mango jelly, but the typical tapioca ball boba like this always make me want to brush my teeth badly. It's something about their sticky consistency. I did enjoy my smoothie from Tea-Do. They had a better selection of drinks available than many other boba tea places I've visited and offering food was nice as well. While in Baltimore, I decided to get some sort of dessert in Little Italy. I came across a bakery called Vaccaro's and decided to give them a try. They had all sorts of pastries, cookies, cakes, and other desserts in here. I had a chocolate and vanilla neapolitan. This flaky pastry was filled with alternating layers of vanilla and chocolate pudding. I wasn't a fan of how it was served in the plastic clam shell container. The chocolate that topped the dessert stuck to the lid and sort of pulled the pastry apart when I went to open the container. This was tasty, although it was definitely more than I could eat in one serving. I found out later that Vaccaro's was part of a larger chain. I came across a Vaccaro's in a strip mall in the suburbs of Baltimore and was also informed that there are a few of these in New York as well. I guess Vaccaro's wasn't the small, independent pastry shop in Little Italy that it initially appeared to be. I did some visiting in the Baltimore area. While there, I parked in Little Italy and walked towards the Inner Harbor. I didn't want to actually eat in the Inner Harbor, so I headed a few blocks away and came across a Chinese restaurant located inside a large building that was formerly a bank. It seemed like the restaurant had a bit of an identity crisis since there were three different names outside the restaurant. The China Room was located on the side of the building. Uncle Lee's Szechuan Restaurant was on the awning out front. Finally, Uncle Lee's Harbor Restaurant was on the window above the door. 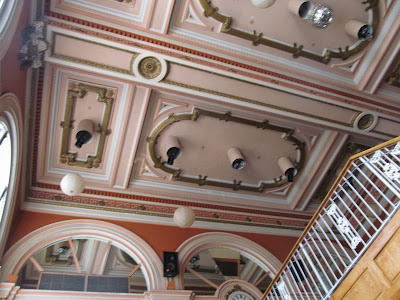 The inside of the restaurant was very impressive. I don't know if this building was something else between a bank and Chinese restaurant, but modern banks definitely aren't built this way. 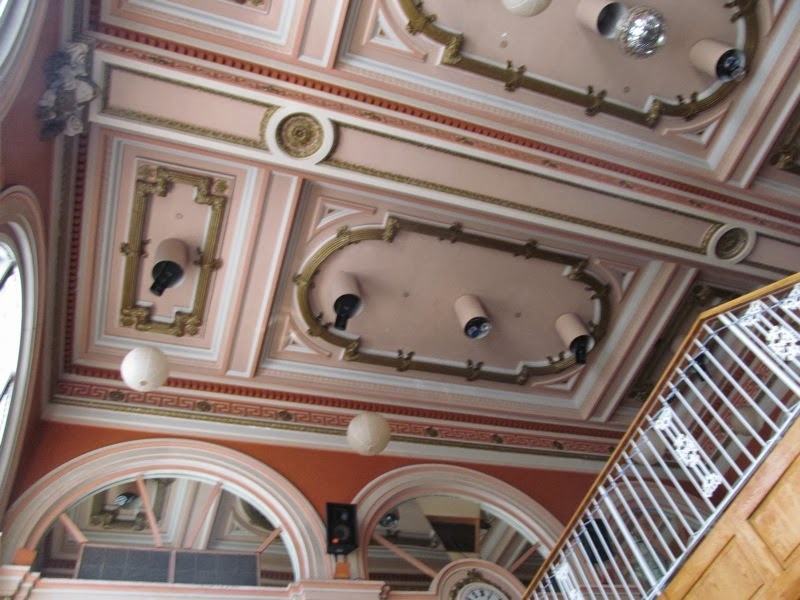 The interior was decorated with all sorts of ornate features. It didn't look very Chinese (except for the lantern globe lights that were added), but it was a very unique building to be eating lunch in. I started with an appetizer of scallion pancakes. These are hard to find in Florida, so I decided to get these fried pancakes when I saw them on the menu. A cup of wonton soup was served next. The dumplings were good although the broth could have used improvement. It was completely clear and basically tasted like warm water. For my meal, I had one of the lunch specials called Baby Shrimp with Szechuan Rice Wine Sauce. A big plate of shrimp was served swimming in sauce. There were hardly any vegetables in here and was a bit boring. Although the menu noted that this was spicy, it hardly had any kick. Rice was served on the side which was very useful in soaking up the pool of sauce. After getting pizza from Dupont Pizza in Washington DC, we stopped for dessert at a place called Larry's Homemade Ice Cream. This place had all sorts of interesting flavors, but unfortunately they were all out of many of the flavors that I wanted to try. I guess that's the downfall of going to an ice cream shop a few minutes before the closed. Since they didn't have the exotic flavors left, I went with a more mundane flavor and ordered a cup of the strawberry cheesecake ice cream. It was good ice cream, with the flavors of both strawberry and cheesecake popping out. Little chunks of actual cheesecake mixed in with the ice cream were also a nice touch. The small cup of ice cream was a bit on the expensive side at almost $5, but it was homemade ice cream in a city. The high price was somewhat expected. I bought a late-night slice of pizza in Washington DC from a place called Dupont Pizza. They were located near an intersection that had far too many restaurants serving pizza (Chicago style pizza next door and an upscale pizza place across the street). As the name implies, Dupont Circle was a few blocks away. I had a vegetable slice topped with spinach, onions, tomato, and mushrooms. I was about to order two slices, this and another variety of pizza, but then I noticed the size of the slices. Each slice was a quarter of the pie. At $5 per slice, the size was appropriate. The slice itself was nice and thin with plenty of toppings. The sauce and cheese lacked flavor and were a bit bland tasting, but the slice did satisfy my hungry stomach. My slice from Dupont Pizza could have been better, but I've also had far worse slices as well. I wonder if they were going for the quantity over taste mindset here? I remembered reading about the Maine Avenue Fish Market sometime in the past. While visiting Washington DC, I decided I should visit this place. The Maine Avenue Fish Market is the oldest seafood market in the country and consists of several floating barges filled with all sorts of seafood docked around a wharf. The floating seafood market setup was way cool and the place had a very unique feel. I couldn't quite figure out if all of the barges here had the same owners or not. Captain White's seemed to be one of the big vendors here, but there were other names on the barges as well. Some barges only sold fresh fish for you to buy and cook at home, while others had pre-cooked seafood, and yet others cooked your food on the spot. I went with a barge that cooked the seafood. Crabs seemed like the thing to get here. I went with a half dozen blue crabs. This seemed like a good deal for $7, plus the whole process of eating the crabs in a fish market was quite the experience. The live crabs were hand picked, sprinkled with seasoning, and dropped into a steamer. After about fifteen minutes, the crabs were cooked. They were placed in a paper bag and were ready to eat. Besides my crabs, I also got a bowl of clam chowder here. The creamy soup was tasty with lots of pieces of clam and big chunks of potato. To eat the crabs, there was a small dining area by the water. There were no seats. Everyone stood around counters smashing their crabs open with mallets and devouring the very fresh, sweet crab meat. I very much enjoyed my visit to the Maine Avenue Fish Market. I suppose if you don't like seafood, this place wouldn't be for you, but why would you be going to a fish market in the first place? The whole setup of buying seafood from barges floating in the river was something that I've never seen before and was a fun experience. It looks like Anthony Bourdain did a segment on the Maine Avenue Fish Market on an episode of No Reservations. When I knew I was making the trip up to DC, I started asking around for places in the area that I haven't seen. The two big suggestions that I was given was going to see Alexandria's Old Town and the National Harbor. Alexandria was done when I ate at La Madeleine Country French Cafe and the National Harbor happened two days later. The National Harbor was basically a large outdoor shopping center with hotels, condos, and convention centers isolated along the Potomac river. The whole place was a bit too clean for my liking, perfect for some people who are terrified of visiting actual cities, but I'd prefer to see other parts of the DC area. While at the National Harbor, I had lunch at a restaurant called Cadillac Ranch. This chain reminded me of a Hard Rock Cafe on the inside for some reason. The mechanical bull at the bar was pretty different from most restaurants though. The menu consisted mostly of steaks, burgers, sandwiches, and flatbread pizzas. I had the sausage florentine flatbread. This wasn't exactly what I was expecting. The florentine part of the pizza wasn't topping the pizza. Instead, the spinach was present in the spinach and artichoke dip that made up the pizza's sauce. Lots and lots of cheese covered the dip, topped with sliced sausage and tomato. The flatbread was a bit soggy and I wasn't a fan of the spinach and artichoke dip. The food at Cadillac Ranch didn't do much for me. If I come across another location of this chain, I don't think I'd eat here again. Ben's Chili Bowl is a restaurant in Washington DC that is pretty famous. As their sign says out front, it's been a Washington Landmark since 1958. 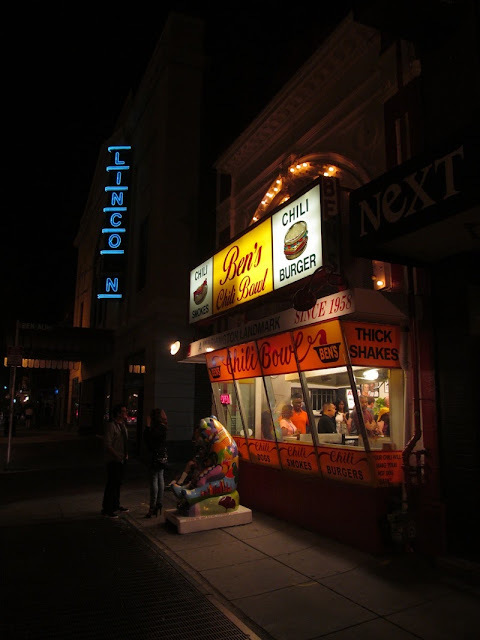 When I got out of the U Street Metro Station and saw Ben's Chili Bowl across the street and recognized the name, I decided I must eat there. They have had some pretty famous customers. Apparently Bill Cosby is a regular here. President Obama also ate here as well, and Ben's Chili Bowl definitely wants you to know this. Both are showcased on a huge mural on the side of the restaurant. Ben's Chili Bowl was pretty crowded on the night I visited. The line went almost out the door. Seems like this place is also popular with the late night bar crowd. Even though the restaurant is called Ben's Chili Bowl, it seemed like hot dogs called smokes were featured more on the menu than the actual chili. Lots and lots of these smokes were being grilled just behind the restaurant's front window. I went in planning on just trying the chili. We had already had dinner earlier, but I figured why not get a snack and try a Washington landmark restaurant while I was there. When I actually got to the restaurant, I changed my mind and decided to try Bill Cosby's Favorite Original Half-Smoke. I'm not even a big fan of hot dogs, but I figured I'd find out what the fuss was about. This was a 1/4 pound, half pork/half beef smoked sausage topped with mustard, onions, and chili. Potato chips were served on the side. The most surprising thing about the whole dish was actually the chili. I have a pretty high tolerance for spicy foods, but this chili had quite the kick to it. Spicy chili is good! Besides the chili, everything else seemed pretty standard for a chili dog to me. I don't think I'd go out of my way to return to Ben's Chili Bowl, but I can now say I've eaten Bill Cosby's favorite chili dog in a Washington landmark that has fed presidents. I don't know what it is, but classic hot dog/hamburger restaurants like this always have a nice vibe to them, but the food just doesn't do it for me. Perhaps if I liked hot dogs a bit more? Much like The Varsity in Atlanta or Nathan's in Coney Island, I can cross Ben's Chili Bowl off my list as a must-eat food experience. I was in DC and was given the recommendation to go exploring in the neighborhood surrounding the intersection of U Street and 14th Street. More specifically, I was told that I should eat at one of the Ethiopian restaurants in the neighborhood. Sounded good to me! We got off of the Metro, not really having a specific restaurant in mind and walked a few blocks until we came across an Ethiopian restaurant called Lalibela. I had never eaten Ethiopian food before so I was excited to give it a try. I wasn't sure what to order, so we decided to split the dinner for two that the table next to us was eating. I really couldn't name most of the items that were served in this dish. I know there was a spicy chicken with hard boiled eggs in the center. Pork, beef, and lamb were also served. Collards, cabbage, and peas were there. That was going to be the extent of my naming of the individual items served, but then I found a blog post about the same dish at Lalibela from iFlipForFood with wonderful descriptions. I learned all the fun details about what I ate from iFlipForFood! All of these individual foods were served on a giant piece of injera, which was like a spongy bread that absorbed all the sauces. No silverware was used in the restaurant. To eat, you basically ripped off a piece of the injera and used it to pick up the food, then ate it all together. Definitely a fun and different way to eat! I enjoyed my first experience eating Ethiopian food. I need to try some more Ethiopian restaurants to familiarize myself with the cuisine a bit more! While in DC, I ended up exploring the Dupont Circle area. While in the neighborhood, I ate lunch at a restaurant called Firehook Bakery. They ended up being a local chain in the Washington area and I passed a few more Firehooks in my travels around DC. Based on their pastry and cake selections, they definitely didn't appear to be a chain. All of this stuff looked delicious! Unfortunately, I was there for lunch rather than dessert so I didn't try any. I had the soup and sandwich lunch combo. I choose tomato bisque for my soup, which I thoroughly enjoyed. It was creamy, slightly spicy, and had just enough tomato flavor so it wasn't overpowering. This was actually one of the best soups I've had in recent memory. A slice of bread was served alongside the tomato bisque for dipping. The sandwich was pressed and filled with turkey, cheese, and roasted red peppers. Pretty tasty, but nothing exceptional. The soup was the definite winner out of the two parts of this meal. I enjoyed Firehook Bakery. When it comes to bakery chains, Firehook was definitely towards the better end of the spectrum. Way better than some of the larger bakery chains (like Panera). I'd return here. As per a DC resident's suggestion, I found myself across the Potomac River in Alexandria, VA. This city had a neighborhood known as Old Town which reminded me a bit of St. George Street in St. Augustine. It was somewhat historic and had all sorts of shops and restaurants on a 16 block stretch from the Metro station down to the river. Fake trolleys drove up and down the streets. Ghost tours were offered. All that typical tourist stuff that old cities like this have. While in Alexandria, I had dinner at a restaurant called La Madeleine Country French Cafe. This restaurant turned out to be a chain, set up very similar to a Panera. I wasn't a fan. I ordered the sandwich/soup combination that the restaurant offered. For my soup, I had the cream of potato, topped with cheese and bacon. The soup was alright for what it was, but very typical of a creamy soup like this. For my sandwich, I had the Croque Monsieur. This was basically a ham and cheese sandwich with a garlic cream sauce. If the ham and cheese had all been inside of the bread, I don't think I would have had issues here. Unfortunately, La Madeleine melted an excess of swiss cheese on top of the sandwich. This ended up being cheese overkill, with the abundance of goopy cheese taking precedence over all other flavors in the sandwich. It was too much, and I ended up leaving about half of my half sandwich. If there was less cheese inside of the sandwich, the cheese on top wouldn't have been too bad, but the combination of inside and outside cheese was the turning point for me. Pasta salad was served on the side, which I also didn't care for. It had a very strong tomato taste which I wasn't liking.